Welcome to What We Learned, a regular practice we engage in together as we learn the value of looking back before moving forward. 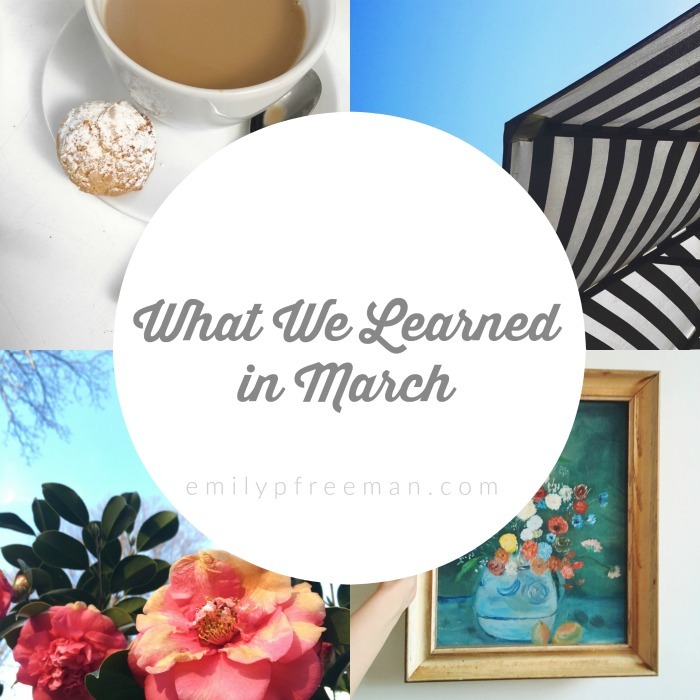 We’ve been doing this monthly round-up for over two years now and I still haven’t grown tired of it. No lesson is too small to share in this space, as you will quickly see when you read my list. 1. Gathering with women who do similar but different work is life-giving. Earlier this month I spent the weekend with four women I admire and we talked business, fears, hopes, finances, motherhood, scheduling, publishing, and more all while eating food and wearing yoga pants. My sister wrote a bit about it here in An Introvert’s Guide to Having People Over. I left with a sense of belonging, of being understood, and a boost of creative energy. If you don’t have a mastermind group, I highly encourage you to create one! 2. There is a difference between being nice and being kind. I wrote more about it in this post, but the book Love Kindness gave me the vocabulary I was missing to explain why I often feel frustration and discomfort when people call me nice. 3. Doodling helps me focus. 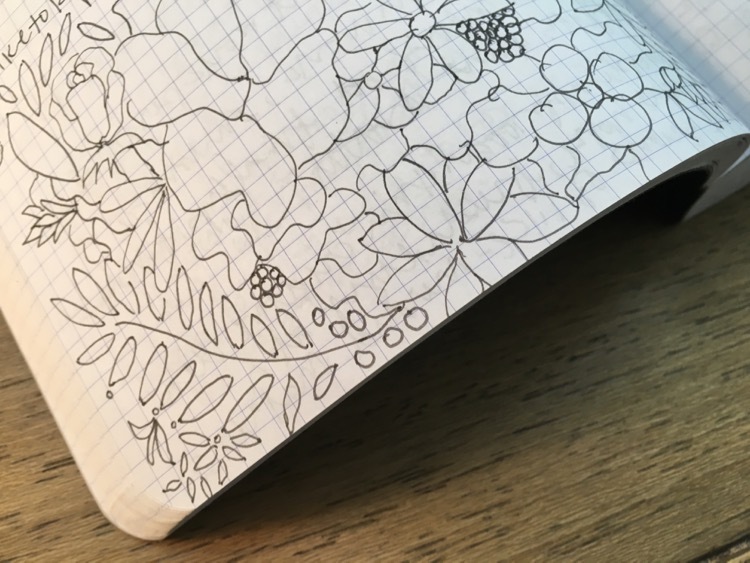 I’ve always known taking notes helps me pay attention during lectures or sermons, but just this month I’ve started to draw flowers and random designs. It’s come out of nowhere and they’re popping up all over my bullet journal. I’m not sure what I think of this new expression quite yet as there’s not quite a point to it. But perhaps that’s the point. 4. 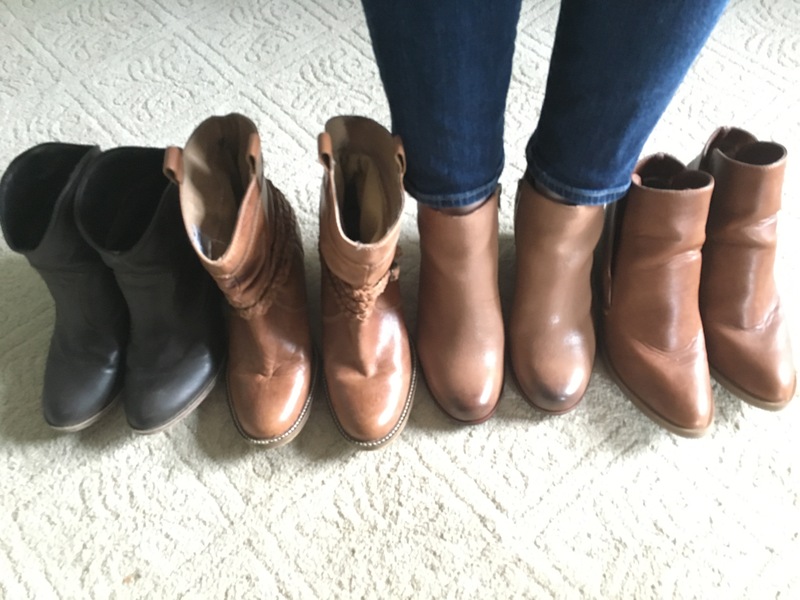 I might have a brown boot problem. Why do I have so many brown booties?! What is happening in my life?! I love shoes so much. I also have shoe shame with this whole redundant brown boot situation. After realizing it this month, I have been forced to admit that the braided brown boots (second from the left) are actually too small so I will finally part with them. This eases my shoe shame. A little. 5. My right foot is bigger than my left foot. Speaking of shoes, after buying a pair of ballet flats it has been confirmed – the left shoe fits like a glove and the right shoe is slightly too tight. Does anyone else have this problem? 6. 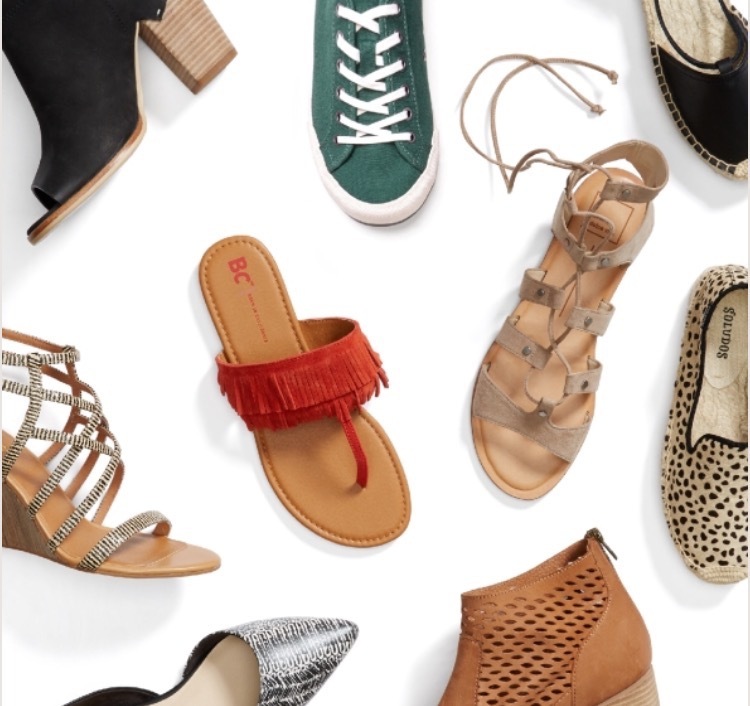 Stitch Fix has shoes now! I didn’t mean for this to become a shoe post but let’s just go with it. Stitch Fix has shoes now! I haven’t reviewed shoes yet, but when I do I will put them on this page. 7. Peppermint oil is my new favorite thing! I’m slowly venturing into the world of essential oils and have fallen for peppermint. I’ve used it when I have a headache and it actually helps. I don’t know what this surprises me so, but it does. 8. I have been doing iPhoto wrong. Y’all this month I had to get serious about my photo situation. My phone, laptop, and the cloud were not syncing up right and I couldn’t figure out why. Until I realized I have 25,789 photos on my computer. Not only that, I’ve been working out of the iPhoto library and completely ignoring that flower rainbow app altogether. 9. One way to honor the place where you are is to tour it on purpose. 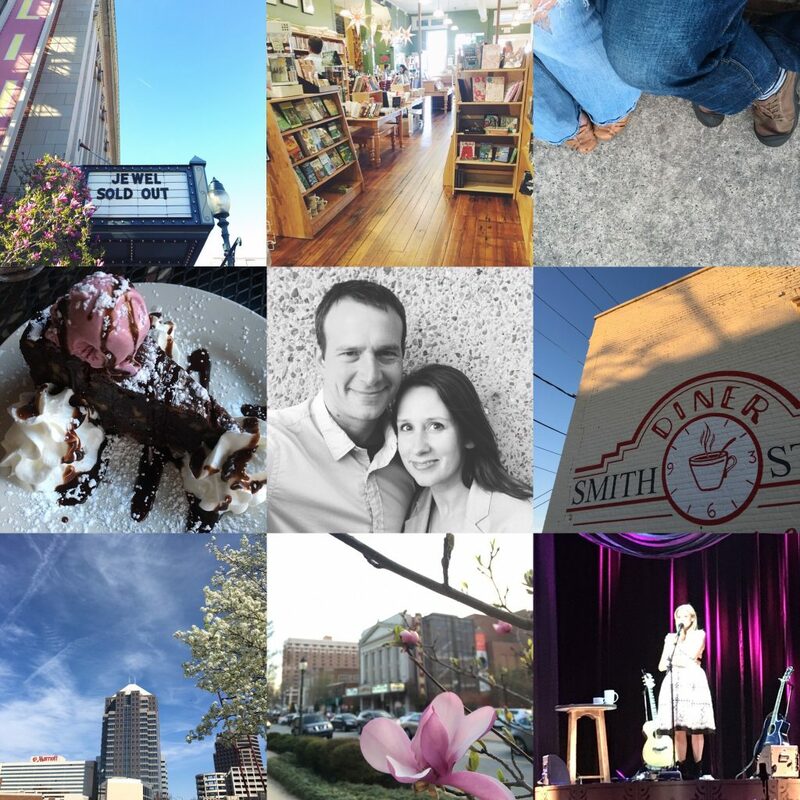 John and I spent a night downtown in our own hometown this month and I loved every minute of it. It’s a tangible way to celebrate where you call home no matter if you’ve lived here for a few weeks or for all your life. 10. Looking back is an important part of moving forward. I enjoy this monthly practice we do together here on the blog. Even more important to me is the private practice of looking back, one I’m working to cultivate on a more daily basis. At the end of the day, questions like where did I see God today? have been a meaningful part of my spiritual formation. Glad you’re here! If you like what you see, sign up here for my monthly notes from the bench, where I’ll share books I’m reading, favorite things, and encouragement for your soul you won’t find anywhere else. To add your own list of what you learned, link up in the form below. I am hooked on essential oils. And, peppermint is one of my favorites! I definitely have the different size feet problem!! Haha- makes flats and closed toe shoe shopping difficult! Thanks for sharing this link up each month- I love participating!! Same foot problem. My left is a half size bigger than the right. That meant when I was dancing I had to buy two pairs of toe shoes at a time. Both my boys also have bigger left feet! My computer also recently alerted me to the fact that we are apparently all out of memory. What?! I totally don’t understand iPhoto and thinking about figuring it out makes me tired. If you have a helpful resource, please pass on the link! Shoes!!! One of my love languages. :p And peppermint is one of absolute faves. In a little hot cocoa etc. Love your monthly linkup. I completely agree with #1. Last night was my monthly Powersheets goals group – just three or four women getting together and talking about getting stuff done. We have similarities and differences and it’s so encouraging to meet up. I’ve lived in my hometown my whole life and there are still places I haven’t ventured. It’s a small town, too!! My daughter is going to take me antiquing with her. #5 My right foot is a full size larger than my left. Nordstrom used to sell shoes in two different sizes if there was a full size difference because all of us have a half size difference. Evidently. So, either my right foot is super tight or left foot is super loose. All the time and since I was 12 years old. A great month. I really loved your post on touring your home town. My husband and I JUST started a blog about visiting places in our home county to encourage others to get out there and become tourists right were you are at. It really resonated with us. Thank you. Also, yes, I have that same foot size problem. When I buy shoes, it is always a question of do I want one too snug or one too loose. Usually the snug wins and eventually it loosens up a bit. Uh, I have no idea how to use iPhoto and all the synching up, and am terrified to open that can of worms. I’m going to pretend there’s no problem. My left foot is slightly bigger than my right. I heard this is the case with most people 🙂 I’m not sure what you mean by brown boot “problem.” I don’t see anything wrong with it! Lol. That’s probably because I’m obsessed with my brown boots. I’m also venturing into essential oils, and I think my favorite would be the cocoa oil that is too expensive to buy, so I stand in the store for a solid 5 minutes just smelling the tester bottle. I’ve had my essential oils forever and all I do is diffuse them! I have heard peppermint works if you’re nauseous so whenever that’s happened I’ve dropped a drop on my tongue and it’s helped! I need to learn more of their uses because after trying to use Thieves on my toothbrush making my lips swell, I’ve scared myself! I love oils! Lavender is one of my favorite right now. There is an oil called “Melissa” that I want to try. Peppermint is great too. My friend has a book about oils and emotions. Yes, it sounds silly, but we laughed at how accurate it seems. The oils we love and hate seem to very much correlate with are emotional struggles. We even made are husband smell them all and tell us their favorite/least favorite scent, sure enough it seemed so telling! It was fun. I am a lover of peppermint oil, too! I haven’t ventured too much further in than that… but it works wonders on headaches and even stomach issues. I used it on our all grown up girlie when she had a severe kidney infection and it was the only thing that took the pain away! I love gathering with small groups of women. My only requirement is that we have something in common–preferably our belief in God!!! I have a group of ex-co-workers who meet once a month for dinner. We talk about the old office, family life, prayer requests, Etc. Basically we do life together! I wouldn’t have it any other way! I have a Bible study group and we like to get together (other than for Bible Study) and talk about life. I find it refreshing to be able to get stuff off my chest & pray for others! First, I have been using peppermint for headaches for several years now. It works perfectly. In fact, I haven’t used Tylenol in almost that long because it works so well. Second, I do find that shoes fit me slightly differently from my left to my right foot. I have heard that it is a common problem. Most people’s feet are not exactly the same size. I add peppermint oil to my peppermint tea…it just tasts better that way! My husband wears a 13 on his right foot and a 14 on his left foot. Nordstrom’s has sold him a mixed pair without charging him more. I have been using some oils for a few months now and peppermint is my favorite due to the fact it really does often cure a headache – and it smells so wonderful! Happy to hear it works for you as well. YES to peppermint oil. Have you tried diffusing it yet? It majorly helps the headache situation as well… plus it livens up the place! I was surprised to receive shoes in my Fix over the weekend (even though I knew it was now possible), and received the most dreamy pair of gladiator sandals! My feet are different sizes too. They used to be size 7, but after one kid they both went to 7 1/2 then after two kids, one stayed at 7 1/2 and the other went to an 8! Now I have to buy size 8 shoes. composed one of my own. I love it. think I am on board for every month. I love a monthly challenge. last year it was weekly, lots of fun but excited about the monthly one.